I have needed a bench vice for some time now and I had this 3' stick of acme threaded rod (acme means its for a vice) a regular threaded rod will wear out very very quick. so if you attempt this make sure you use the acme stuff. I will be trying a moxon vice soon as well. so keep looking. Step 1: Start by Making a "nut Case"
I had no plans or idea on how to make one of these I winged it every step of the way so I wont go into detail on the dimensions. the jaws are 10" wide and 6" tall the dowel handle i use is 1" poplar and and the dowels for the front and rear slide supports are the same. You have to start by encasing the nut with an opening to allow the threaded rod to pass through you could do this a few different ways. My way was just the way it happened, no plans remember? 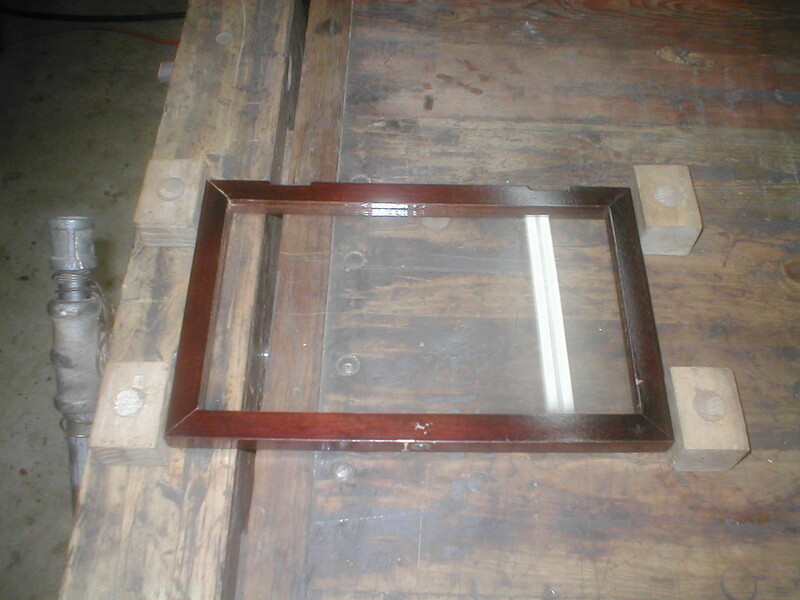 I cut the jaws for the vice and the front and rear dowel supports. Drilled the holes for the dowels and threaded rod. After that I cut the ends about 2" in from each end (see picture for detail) on the two for the rod supports. After they are cut, glue them in the rear rod support board flush and pound in the wedge with a mallet and cut them flush. Make sure you drill the hole for the acme rod in the front jaws before you glue it to the front jaws. Also make sure you dry fit things before you glue anything. Take a look at the pics and place everything in line and glue clamp and let it sit overnight. Install a spindle about 4" thick round it up sand it part off about 4" worth or length. Drill an undersized hole in the end for the rod to tap into. Then drill a 1" hole through the side for the sliding handle. you can use a file, but I used a grinder to cut a slight taper on the end of the rod and then made 3 grooves going vertical about 1.5" in. Now put a nice blob of epoxy in the hole and screw the rod into the handle. let it sit overnight. (note that it is IMPERATIVE that you screw it in straight). Step 5: Mount It to Your Bench! Its finished. I used some parafin wax on the rod and the dowels to allow it to slide better. but all in all I think it turned out pretty good. I also used some leather washers for the front to prevent it from causing too much damage on the jaws of the vice. - Can you emphasis what are the parts that are moves and the parts that are fixed ? - How do you fixed the parts ? by glowing only or by additional support ? - How important is the thickness of the parts ? - Can you make a short movie of the vise in motion / operation ? Another question.. Did you do anything to hold the underside carriage together to prevent side to side racking later down the road? I'm considering the same thing except for building the carriage part as one piece. I guess at some point soon I'll get busy and put one together. The reason I ask is because I made one some time back and it worked at first, but over time began to hang up and became useless. I haven't started construction yet but I've taken a lot of time to work out the design details. 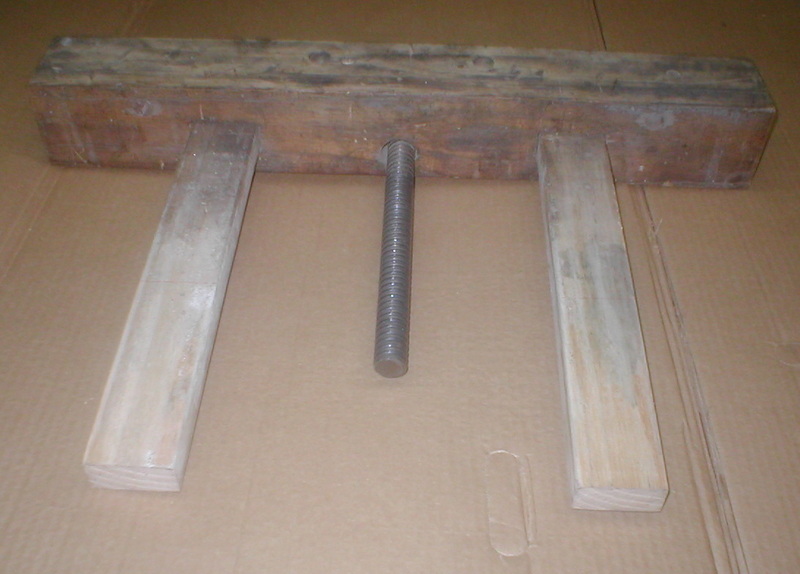 I'm going to purchase a Shop Fox 20" Acme thread bench screw for mine and use hardwood dowels to prevent racking. It seems to me that the rear jaw should be mounted to the side skirt, dead level with the top. The rear framing...could be what you termed the "underside carriage," should be solidly connected to the framing of the bench. In my case, that will be about 15" behind the side skirt. 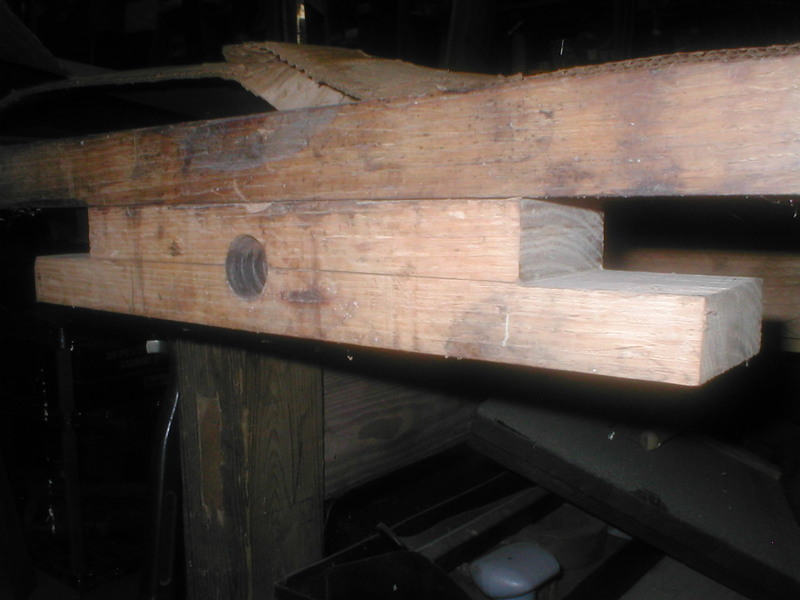 I intend to solidly fasten the dowels to the front jaw and them slide through the rear jaw and rear framing as the vise is opened and closed. I will make them removable for possible replacement or to troubleshoot problems. Looks great, just what I need for my new bench. When you unscrew the handle does the face move out by itself? Did you add something for that? In my sketch it looks like the screw and handle would move out by themselves. Thanks! Perhaps try cutting a slot in the sides of the rod to add an e-clip to hold the chop.. Many bench vises use the same method. Be sure to counter sink an area on the back end though or the e-clip will catch on your work.. This is really nice, but a few questions..Any problems with racking so far? I found a company that sells acme threaded rod and nuts to match. http://www.dependableacme.com/ and they do sell to the public.. Prices aren't that outrageous..
good idea. think I'll give this a try. BTW acme thread just means the thread profile is trapezoidal. It is used for other things than vises. 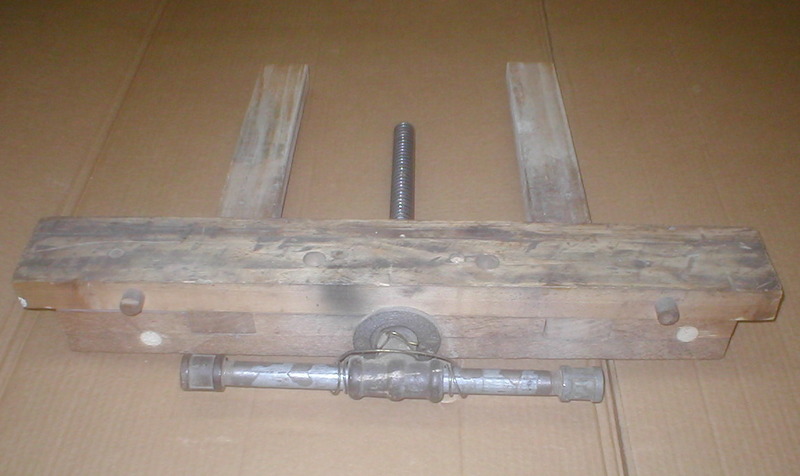 I found an old rotted out vise in my old cellar and rebuilt the wooden parts of it. I took the basic design of it and modified it slightly. I used something called a hidden dovetail in order to hold my guide bars. Threaded rod can get pretty pricey. You can find some in some old car jacks though. It depends what style jack what is inside of them. Nuts in jacks are never hexagonal. So it is a challenge to box them in. Acme taps are stupid expensive too. So tapping acme threads is not an economical option. I wrote an article about making an acme tap. But it won't tap steel. Almost, but not quite. You'd be surprised how much force a plastic nut has. Enough for a wood vise. I was wondering what the function of the front rod support is, since the rear jaw supports the rods just a couple of inches in front of it. it closes the back of the nut case. I've sketched up your design (helps me work out how designs work). If it helps anyone feel free to use it: It's in PDF form. hey like the sketch...also like your site, I have an interest in drafting and plan on going to school for architecture. thanks...i should be able to get free tuition at the university my father works at and go to their school of architecture and get LEAD accreditation and all that so i should be well off.